TOKYO - British rocker Kim Wilde will receive a substantial career boost in Japan this year, according to her label Toshiba-EMI, when she appears in a new television commercial for a soft drink manufactured by Calpis. Similar exposure has boosted the popularity of other foreign acts, such as Leif Garrett and the Osmonds (latter was also associated with Calpis). 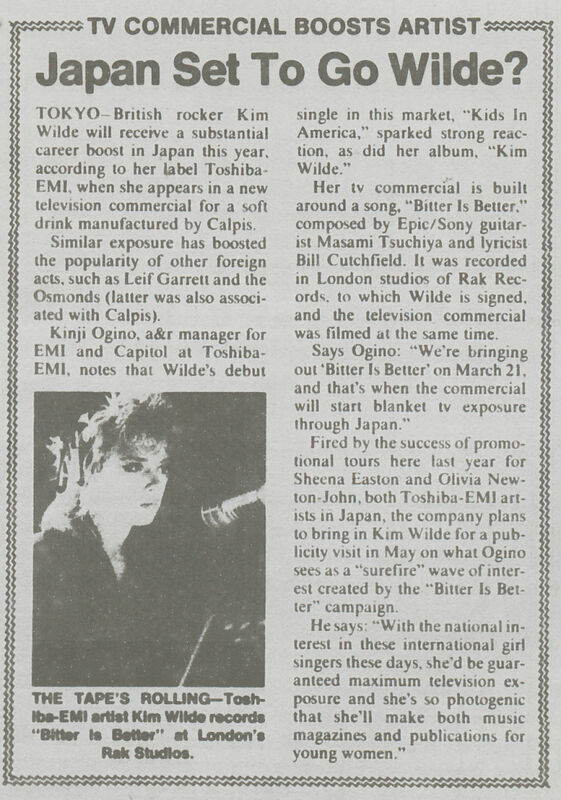 Kinjo Ogino, A&R manager for EMI and Capitol at Toshiba-EMI notes that Wilde's debut single in this market, "Kids in America", sparked strong reaction, as did her album, "Kim Wilde". Her TV commercial is built around a song, "Bitter is better", composed by Epic/Sony guitarist Masami Tsuchiya and lyricist Bill Cutchfield. It was recorded in London studios of RAK records, to which Wilde is signed and the television commercial was filmed at the same time. Says Ogino: "We're bringing out 'Bitter is better' on March 21, and that's when the commercial will start blanket TV exposure through Japan". Fired by the success of promotional tours here last year for Sheena Easton and Olivia Newton-John, both Toshiba-EMI artists in Japan, the company plans to bring in Kim Wilde for a publicity visit in May on what Ogino sees as a "surefire" wave of interest created by the "Bitter is better" campaign. He says "With the national interest in these international girl singers these days, she'd be guaranteed maximum television exposure and she's so photogenic that she'll make both music magazines and publications for young women."